S&P (/ES) short at 2,800 fell to 2,792 is just 8 points at $50 per point for gains of $400 per contract. 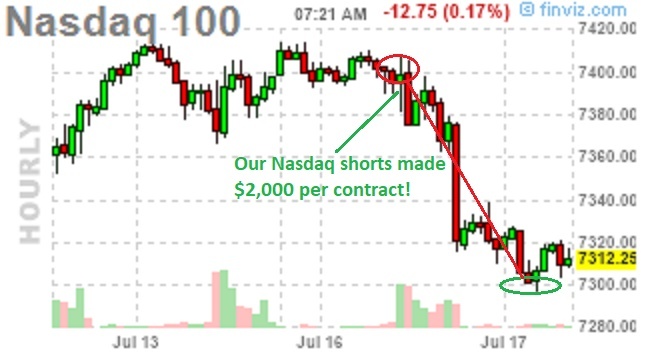 Russell (/RTY) short at 1,690 fell to 1,675 and 15 points at $50 per point was a gain of $750 per contract. And, of course, our Netflix (NFLX) short play will be doing very well this morning as that stock dropped $50 (12.5%) on disappointing subscriber growth and we could see that coming a mile away as no stock is likely to justify 250x earnings – even in the best conditions and we simply didn't see the current economic conditions (rising oil prices, economic slowdown, political turmoil) as a good recipe for continued super-bullishness on NFLX. There is, however, still time to initiate our bullish earnings trade on Sketchers (SKX) as detailed in yesterday's Report. That stock finished right at $31.07, down 0.22 for the day despite our bullish pick – but what do we know? Speaking of what we know, my comments were featured in Investing.com's weekly commodity outlook and that led to yet another $2,000 per contract day's gain on Oil (/CL) Futures shorts at the $70 line – which is a follow-through from our $5,000 per contract gain from our original call to short oil at $75 on July 3rd (nailed it! ).